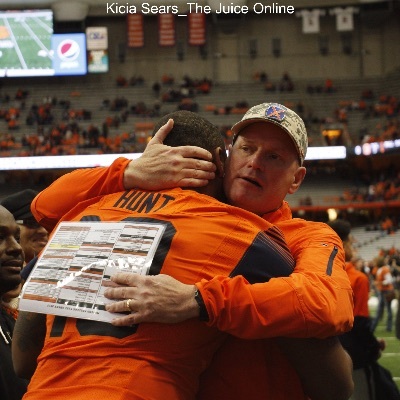 His fate already sealed by Monday’s announcement that Saturday’s game against Boston College would be his final one as the Syracuse head coach, Scott Shafer did the only thing that was right – win a game that a former defensive coordinator like him could love. The coach who turned “hardnosed” into a buzzword as the leader of the Orange steered his team to a 20-17 win over Boston College in a defensive struggle that was not decided until the final play when Cole Murphy drilled a 35-yard field goal. The kick started an emotional celebration. Next to a crowd of celebrating SU players, Shafer shared an unusually long postgame hug and discussion with Eagles’ coach Steve Addazio, then got a ride toward the end zone on the shoulders of his players. Following the marching band’s rendition of the Syracuse alma mater, Shafer was mobbed by his players, all wanting to offer a congratulatory hug to the man who would no longer coach them. 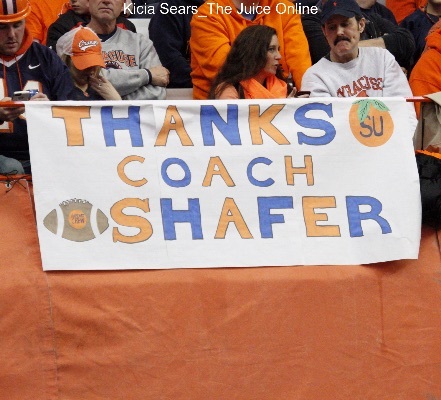 It was an emotional day for Shafer, who saw his final season end at 4-8, giving him a three-year mark of 14-23. He was clearly worked up when arriving at his postgame press conference, struggling to finish his remarks while maintaining his composure. Shafer expressed his gratitude to the school, the community, and the military involved with the football program before firing off a loud “Go Orange!” and abruptly departing. Defense was the name of the game and neither team had much early success. The second SU drive ended late in the opening quarter when Zack Mahoney tried to make a great play with a late option pitch. The toss turned into a fumble and Boston College recovered at the Syracuse 33. Four plays later, the Eagles were in the end zone and grabbed a 7-0 lead with a little over two minutes left in the quarter. The Orange responded with a scoring drive, taking advantage of three BC penalties that netted them 44 yards. Mahoney atoned for his earlier mistake with some slick ballhandling on an option look before slipping a quick pass to Erv Philips. Philips darted into the end zone from two yards out for the score. Cole Murphy booted the conversion to make it a 7-7 game just under 90 seconds into the second quarter. The two defenses took center stage at that point. Each unit forced a pair of three-and-outs before the Syracuse defense upped the ante. Defensive end Ron Thompson crashed into the Eagle quarterback, forcing his pass to float high in the air. Cordell Hudson settled under the ball for an interception and returned it 22 yards to the BC 34. The SU offense was held back by a holding call and logged their third straight three-and-out. The turnover, however, netted Murphy a field goal try of 49 yards from the left hash mark. The kick split the uprights with distance to spare and gave the Orange a 10-7 lead with 2:25 left in the opening half. Three plays later, it looked like Syracuse might be able to add onto that lead when Antwan Cordy picked off a pass for the second straight game. Even though they took over at their own 46, the Orange offense could not capitalize and ended up punting shortly before half. What the Orange did capitalize on, however, was their first second half possession. Three plays after their drive was extended by a pass interference flag on the guests, Syracuse got a 31 yard run from Philips, which brought the Orange down to the Boston College 12. Three plays later, Steve Ishmael snagged a slant from Mahoney for his seventh touchdown grab of the year. Murphy connected on the extra point and SU held a 17-7 lead just over four minutes into the third quarter. The Eagles struck back, needing only two plays to score a touchdown of their own. The extra point shaved the Orange lead to 17-14. The defensive struggle sank in, as neither team was able to score for the remainder of the third and most of the fourth quarter. At that time, though, Boston College was able to grind out 41 yards to get into field goal range. The 43-yard try was good, tying the game at 17 a side with 2:42 on the clock. SU patched together a methodical drive that brought them to the Eagles’ 18 with the ball centered between the hashes. 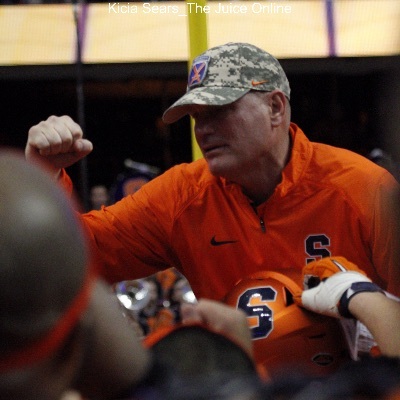 Scott Shafer called time out with three seconds remaining on the clock, trusting the game to his field goal unit. BC, who had a pair of time outs left, cashed in both stoppages in an effort to get under Murphy’s skin. Murphy was not rattled, calmly connecting on the 35-yard try and giving the Orange the 20-17 victory that sent the team racing onto the field in celebration. Erv Philips was a primary source of offense for SU, carrying the ball nine times for a team-leading 73 yards and adding five receptions for 21 yards and a score. Jordan Fredericks netted 48 yards on 13 carries. Zack Mahoney picked up a mere 88 passing yards, but did toss a pair of touchdown passes. Zaire Franklin led the Orange with seven tackles, including a pair for loss. Ted Taylor also had a pair of tackles for loss, including the lone sack registered by the unit. Antwan Cordy and Cordell Hudson each had an interception in the contest.